Constable Ichabod Crane (Johnny Depp) is dispatched upstate to the village of Sleepy Hollow. Several villagers have been decapitated – their heads stolen – and while Crane searches for the killer, the locals suspect a supernatural cause: the Headless Horseman is riding again. One of the most underrated horror franchises, assuming one can safely call it that, is the three-film series that Francis Ford Coppola’s American Zoetrope produced between 1992 and 1999. It consists of Coppola’s own Bram Stoker’s Dracula, continues through Kenneth Branagh’s Mary Shelley’s Frankenstein, and concludes with Tim Burton’s film Sleepy Hollow. Three admirable, inventive and hugely entertaining takes of classic horror literature, and all linked by the combination of production company, auteur direction, and genre. All three remain to my mind under-appreciated. Sleepy Hollow is tremendous fun. It is arguably the pinnacle of Tim Burton’s career: not necessarily his very best feature, but absolutely the moment at which his distinctive pulp gothic aesthetic was matched by the strongest possible production style and techniques. He has not made a film this good since. It also captures star – and regular Burton collaborator – Johnny Depp at an early height of his talents. He exaggerates Ichabod Crane just enough to make him a distinctive and original protagonist, but not so much that his character becomes a grotesque parody. The screenplay (credited to Andrew Kevin Walker, but extensively rewritten) reworks Washington Irving’s original story to form a more gripping and complex feature. Crane is transformed from a repulsive and cowardly school teacher into an eccentric police detective. The Headless Horseman (played by Christopher Walken in flashbacks and Ray Park when sans head) gets an additional amount of back story and depth. As director, Burton takes his lead from Britain’s classic Hammer Studios. The blood is plentiful and visibly fake. The performances are heightened. 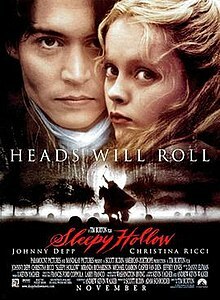 Unsurprisingly, given his childhood obsessions with films, Burton takes more inspiration from the Walt Disney animation of Sleepy Hollow (included in The Tale of Ichabod and Mr Toad) than the original novel. Periodically he directly reproduces a scene from the cartoon in live action. It is, all in all, a tremendous amount of fun and wonderfully balanced: just funny enough, just scary enough, just dramatic enough. Blockbuster films this well-balanced are comparatively rare; it’s worth appreciating them when they come. It’s arguable that Burton never worked with a stronger cast: not just Depp back at his height, but also Walken, Christina Ricci, Michael Gambon, Miranda Richardson, Ian McDiarmid, Richard Griffiths, Christopher Lee, Michael Gough and several others. Each of them is superb: it’s a film without a single weak link among the acting. The costumes and sets are marvellous, with the film shot mostly on a soundstage. It gives everything a strong sense of theatricality, and that is a sense that suits the script and the performances. The film is also nicely placed at the dawn of the CGI era of filmmaking: there’s enough CGI here to enhance and elaborate, but not so much that it overwhelms or weakens the picture. Future Tim Burton pictures would become over-reliant of computer-generated imagery, a technique that ruins the physical hand-crafted artistry of his earlier works. Sleepy Hollow is a perfectly balanced, handsomely produced piece of film entertainment. It showcases a director at his absolute best; I dearly wish he could one day reach these heights again. Agreed! This is the only Tim Burton movie that I can both appreciate and enjoy. Time for another rewatch.